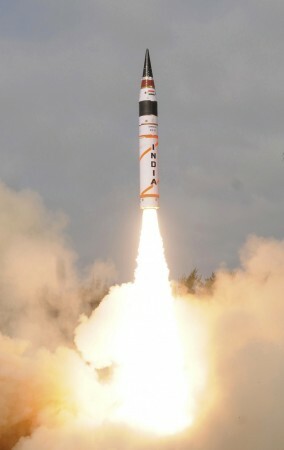 India will test fire Inter-continental range Ballistic Missile (ICBM) Agni-V around mid-March. Indian defence research and development labs are gearing up for the canister test launch of Agni-V missile, a nuclear-tipped surface-to-surface Inter-continental range Ballistic Missile (ICBM) with a possible operational range of over 5,000 km, on March 15. This could most likely be the last of the developmental trials for the most powerful Agni series missile before being operationalised in 2017, the New Indian Express reported, citing sources. Moreover, the test launch could be witnessed by Prime Minister Narendra Modi and Defence Minister Manohar Parrikar, following an invitation from the Defence Research and Development Organisation (DRDO). The test will be conducted from the missile testing facility in the Abdul Kalam Island (earlier known as Wheeler Island). India joined the U.S., Russia, the U.K., France and China, who boast ICBM capabilities, when it tested its first Agni-V missile in 2012. It is a three stage solid fuel missile that is capable of carrying 1.5 tonnes of nuclear warhead. The report noted that Agni-V showcases advanced technologies such as ring laser gyroscope and accelerometer for navigation and guidance. It has a greater accuracy than its predecessors and the canister version brings flexibility to the weapon system. Agni-V is billed as India's answer to the Chinese DF-26 Intermediate Range Ballistic Missile (IRBM). Moreover, it can be equipped with multiple independently targetable re-entry vehicles (MIRV), which can carry multiple warheads for different targets. The report claimed that DRDO is also working on the integration of long-range missiles with MIRV with six to ten warheads. Previously, a DRDO scientist was quoted as saying by the New Indian Express that MIRVs are the "next focus."